WAGs - Wrist Assured Gloves. Aerial Yoga Swings - Trapeze Spreader Bar 60cm By Firetoys. This spreader bar essentially turns a single rigging point into two rigging points! 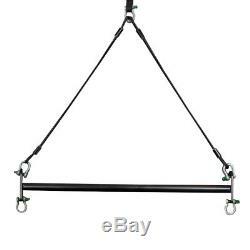 If you only have one point to hang aerial apparatus from then this spreader bar will be very useful for hanging aerial yoga hammocks and trapezes. 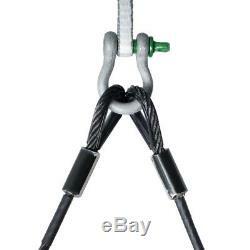 As standard, this product comes with 1x 60cm spreader bar, 2x 50cm black steel cables and 5x shackles. 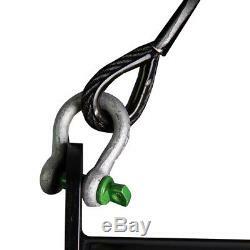 As an optional extra you can add a pair of 1m long black steel cables to hang below the bar. The extra 1m cables are useful if your anchor point is very high up and you need your trapeze or yoga hammock a little lower. The spreader bar is made from steel and has the same high quality, black powder coated finish as our aerial hoops. The bar is 60cm long and the plates at the ends are 10cm tall and 5cm wide. The steel cables are also manufactured to a very high standard and continue the sleek black theme of this trapeze / aerial yoga spreader bar. The sling shown at the very top of the main picture is not included and is just for illustrative purposes. Aerial Yoga Swings - By Firetoys Country of Manufacture - UK Working Load Limit. 150kg (330 lbs) Breaking Load Limit. Weight Load Tested In The UK, Made To European Standards. Add to your Watch List. We Love Yoga and Fitness! Yoga Studio is a family business. Yoga Studio has been around since 2003. At Yoga Studio, our aims are Simple: 1. We will beat any like for like quote. "Can do attitude" - "You want it - you got it" 3. Mix & Match wholesale - no MOQ on wholesale. If you want you logo or picture on yoga equipment we can help. With embroidery, screen printing, heat press transfer or digital printing we offer the most comprehensive range of personalisation options for you, your business or just to make a fun present. Custom Print: Yoga Studio offer custom/personalise Logos and Designs for clients. Your logo on Yoga Mats, Your Design on Yoga Mats. Ethical values are very important to Yoga Studio. You will see in the FAQ's section that we don't just repeat what the manufactures say about their products. We give you our opinion as well, letting you make an informed decision. We don't sell what we consider unethical products. Take the ecoYoga mat for example - made in the UK from latex and jute. This is the truly only eco-Yoga mat made from latex that is offered for sale in the UK. There are several other brands and companies that offer a "similar" Chinese eco mats and pass them off as "eco-mats" - but they are not. They totally contradict what an eco-yoga mat should be, with the chemicals embedded in the material, the manufacturing standards and the pollution casued. Be assured that we will always stock quality items that are sourced responsibly. We work with our suppliers to ensure the health and happiness of their employees. Sustainable materials are used as far as possible and we are trading ethically. Yoga Studio strive to be the Most transparent, honest, unbiased Yoga and Fitness equipment retailer and wholesaler Worldwide! We look forward to providing you with the service you deserve. We are always here for advice, a chat, or just to say hello! We offer Wholesale for all teachers/instructors. However if you`re not in don't worry they will put a card through your door with instructions on how to get your parcel. All international orders are sent using a Parcel Force internationalsigned for service. We know how important it is to feel protected and secure when shopping online. That's why we go out of our way to make sure that's how you feel when shopping with us every time. No Quibbles Guarantee: We want you to be delighted every time you shop with us, however we appreciate that occasionally your items may arrive and not be quite what you hand in mind. We are proud that our No Quibbles guarantee gives you more than your statutory rights, so we ask that you use this policy fairly. If you wish to return your item please get in contact with us at. Mix & Match wholesale - low MOQ on wholesale. You may Also Like this! The item "Aerial Yoga Swings Trapeze Spreader Bar 60cm By Firetoys" is in sale since Monday, August 14, 2017. This item is in the category "Sporting Goods\Fitness, Running & Yoga\Yoga & Pilates Equipment\Other Yoga & Pilates".